LAUSANNE, Switzerland　February 22 -- The World Baseball Softball Confederation (WBSC) today released the latest WBSC Baseball World Rankings, which weigh a country's National Team performance -- from U-12 to Professional -- in WBSC-sanctioned international competitions over a four-year period (2015-2018). 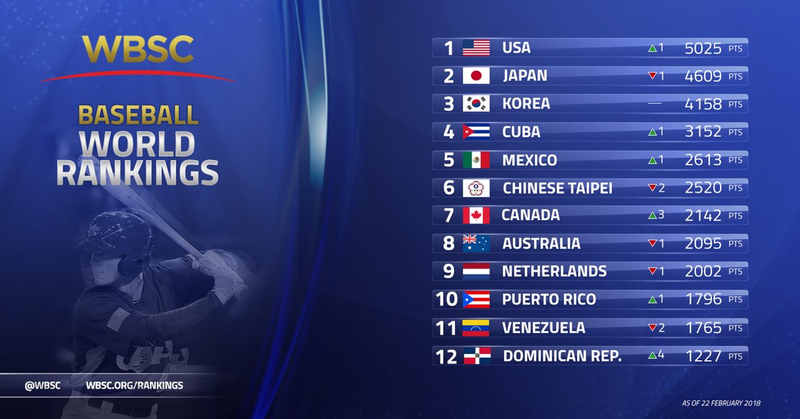 The new rankings reflect the expiration of all points earned in 2014 international competitions, such as the U-21 and U-15 Baseball World Cups, the Asian Games, the Central American and Caribbean Games, continental championships and friendlies. After more than three years at No. 2, the United States of America has overtaken Japan to reclaim the top spot in the WBSC Baseball World Rankings. In 2017, USA Baseball squads swept the world championships -- U-12 Baseball World Cup, U-18 Baseball World Cup and World Baseball Classic -- helping the nation to amass a record high 2,127 annual ranking points. Japan dropped to No. 2, relinquishing the No. 1 ranking that the nation had held since November 2014. Republic of Korea held its No. 3 position, while Cuba moved up a place to No. 4. Mexico has climbed to the highest the nation has ever been ranked, advancing one spot to hit a historic high of No.5 in the world. With ranking points having expired from the U-21 Baseball World Cup 2014, winner Chinese Taipei fell two places to No. 6, while Canada advanced three spots to No. 7. No. 8 Australia remains Oceania's top ranked country, while No. 9 Netherlands holds onto the title as Europe's most elite baseball nation. The Dominican Republic leaped past No. 13 Nicaragua, No. 14 Panama and No. 15 Italy, advancing four places to No. 12. The Top 12 ranked nations at the end of 2018 will battle in the November 2019 WBSC Premier12, the second edition of the men's professional national team global championship. A select number of top finishers from the II Premier12 will gain direct entry into the Olympic Games Tokyo 2020. "This is a very exciting and critical time leading up to the WBSC Premier12 2019 and Tokyo 2020 Games," said WBSC President Riccardo Fraccari. "These next years will be among the most important for baseball/softball to continue emerging as a major global sport." The official 2018 international baseball calendar features two world championships that will have the biggest impact on this year's men's baseball world rankings: the U-15 Baseball World Cup (10-19 Aug.) in Panama City, Panama, and the U-23 Baseball World Cup (19-28 Oct.) in Managua, Nicaragua. The WBSC Baseball World Rankings web-based version and formula can be found at www.wbsc.org/rankings.